Officially announced in September, at the same time with the Moto 360 (2015), the Motorola Moto 360 Sport is now finally ready to hit shelves around the world. The smartwatch will first be available in the UK and France, where it's supposed to go on sale later this month, on December 18. In the US, the Moto 360 Sport will arrive a bit later, on January 7, costing $299.99. Other markets that will get the device in early 2016 are Canada, Brazil, Spain, Mexico and China. Like the regular Moto 360, the Moto 360 Sport runs Android Wear, features an almost-circular display (1.37 inches, 360 x 325 pixels), and is powered by a quad-core Snapdragon 400 processor. However, instead of metal, the Moto 360 Sport is made out of silicone. It's got built-in GPS, and an optical heart rate sensor, both of which make the watch a perfect companion for sports and fitness activities. Also on board are 512 MB of RAM, 4 GB of internal memory, and a 300 mAh battery. 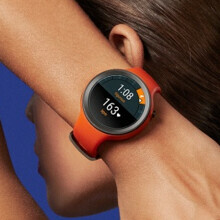 The Moto 360 Sport smartwatch is water-resistant (IP67-certified), and will be available in three color choices: black, white, and flame orange. Are you planning to buy one? Seriously, $300? It looks nice, but there's no way I'd spend $300 when the Microsoft Fitness Band costs $50 less and does far more in terms of fitness and capabilities. Lol the Fitbit Charge HR can be bought for $120 at Walmart. I bet you would ve beem drooling after reading this article if this was made by Apple. Weren't you the one who kept throwing his money at the screen when the Apple Watch was announced for as low as $350 for the base model which has the same build materials as this Moto Sport and does far less than this as well? The Apple watch doesn't have GPS, so if you want any accuracy when you run, jog, bicycle ride, or even go for a long walk then you need the iPhone. At least this Moto 360 can be completely standalone. Also Mxyzptlk saying that the Microsoft band and does far more in terms of fitness. Both the Moto 360 sport and MS band have GPS, heart rate monitors, pedometers. The MS band has a UV sensor, and barometer. The barometer is not really needed because with GPS you can also acquire your elevation. Now as far as being a Smartwatch, then the MS band is really lacking in that department. Especially since the processor, ram and storage is really limited on MS band. The MS band only has a few MB of ram, and a few MB of storage. Not to mention the processor on the MS band is a MCU STM32F4. Whereas all Android Wear devices have a full fledged CPU with 512mb of ram, and 4 gb of storage. Not to mention there is WiFi and you can pair Bluetooth headsets or speakers to any Android Wear Smartwatch. You can also install and listen to music, watch YouTube videos or movies now on any Android Wear watch. You can even install and play games like Doom, half Life, Quake, Gameboy emulators, mame games, SNES games. You can even control movies on a chromecast, unlock car doors, unlock door locks, and so much more with Android Wear. None of which can be done on the MS band. First of all, the Microsoft Fitness Band is a FITNESS BAND. It does its job well. Why would I want to play a game on something that's on my wrist? That's what my phone is for. I don't need a list of crappy features that won't be as user-friendly as they would on a phone. If I wanted an Android Wear smartwatch, I would get the infinitely better Fossil Watch Q or the LG G Watch R or Urbane. Comparable GPS watches go for upwards of $300. Addidas and TomTom are the only 2 GPS watches with built in storage for music and they are both $299. With this watch you're getting everything you would in a full featured GPS watch PLUS that of a smart watch. Maybe $300 isn't right for you, but for those that use GPS watches on every run, $300 isn't a terrible price compared to the market. Not only that, in four or six months, it will be fifty dollars less, just wait. It is and I would choose it over the other Moto 360 variants. I just happen to find the Fossil Watch Q a more suitable design for the price. When i saw the word moto on the heading i know i will find Mxyzptlk here. Its like a charm or should i say bane. Don't get salty. It's my personal opinion so get over it. The Apple Watch does not have a stand-alone GPS. I like it, but don't want it. What does that even mean. You typed as if you are a 12 year old kid. I'll pass... when one of these gets a better battery like at least a week then I can buy one..